The Samsung Galaxy S6 made a splash at Mobile World Congress 2015: after all, it’s the first phone to ever feature a double edge design with the screen wrapping around both of its sides. A straight out of the future design, the Galaxy S6 is also solidly put together with a metal frame and glass on both the back and front, a welcome change from the mundane plastic designs of previous Galaxies. You know which phone had a metal frame sandwiched between two pieces of glass way before, though? The Sony Xperia Z series, and while it lacks the double edge (it has a traditional, no curvature display), it does have style and with its price having dropped down, it carries some extra appeal. We won’t just look at price and design: we compare the Galaxy S6 edge against the Xperia Z3 in all aspects: system chip, performance, display, camera, and more. The Galaxy S6 edge is a lot about a re-focus on design: it’s slim and lightweight, featuring premium materials (metal for the frame and glass on both front and back). 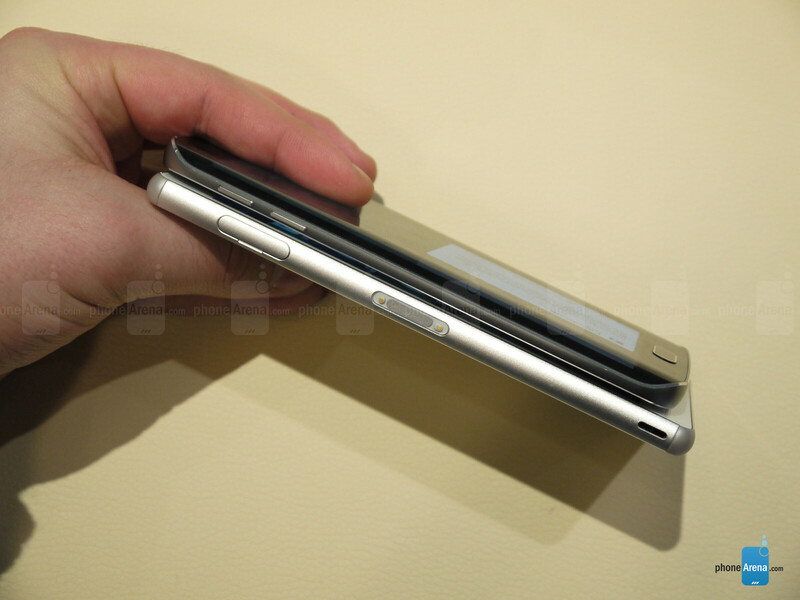 The Xperia Z3, on the other hand, features the same fine materials, but in a different shape. The differences are as follows: width measures at 2.76” on the S6 edge and 2.83” on the Z3, thickness is 7mm on the S6 edge and 7.3mm on the Z3, and finally weight is 4.66oz on the S6 edge and 5.36oz on the Z3. It’s also worth mentioning that the S6 edge comes with a protruding camera, while the Z3 has a camera module that’s flush with its back. It’s not a big deal for us, but when you lay the S6 edge flat on a table it does wiggle a bit. The Galaxy S6 edge also comes with a fingerprint scanner that the Z3 lacks. It’s a touch sensor like on the Apple iPhone 6, and it is used in the brand new Samsung pay system. Samsung bragged about the Galaxy S6 edge having the best screen on a smartphone. It’s a 5.1-inch Super AMOLED screen with a 1440 x 2560-pixel (Quad HD) resolution, and Samsung has done some huge improvements to the brightness of the S6, saying that it can now go to up 600 nits. The Sony Xperia Z3, on the other hand, features a 5.2-inch LCD display with a 1080 x 1920-pixel resolution. Both are very sharp displays and it’s hard to see any jagged pixels on either. If you care about the numbers, the difference in pixel density is 577ppi vs 424ppi. The edges on the Galaxy does not interfere with the regular look of the interface (the side parts are not permanently visible on top of TouchWiz), but you can bring them up with a swipe to the side to get quick access to contacts, for instance. You can also bring them up for quick info when the phone is lock, so you can save battery by checking notifications without firing the whole screen. Good news is that the Galaxy S6 edge seems to bring an improvement in color accuracy (from earlier, greenish AMOLED displays). The Xperia Z3 already has fairly good color reproduction, so we’re looking at two vibrant, pleasing screens. The Galaxy S6 edge sports the latest version of Android, 5.0 Lollipop, while the Xperia Z3 features Android 4.4 KitKat (with an upgrade path to Lollipop). Samsung is now also a step ahead of the rest in the Android [ack with Samsung Pay, the new payment system using the fingerprint scanner. Samsung Pay launches in the United States and Korea this summer. Let’s see how this plays out in the near future. The Galaxy S6 edge features a 14nm octa-core system chip with a big.LITTLE configuration using four cores running at up to 2.1GHz (likely, A57s) and four running at up to 1.5GHz (likely, A53s), and it’s the first phone to come with a 14nm chip, according to the company. Samsung did not say that it is using the Exynos 7420, but all indications point in that direction. Good news is that with the Galaxy S6 edge, Samsung has finally parted ways with 16GB of internal storage and makes the jump to 32 gigs of internal storage in even the base model, while the Xperia Z3 features half the storage at 16 gigs. The Z3, however, does support an expansion microSD memory card slot, while the S6 edge does not have expansion capabilities. 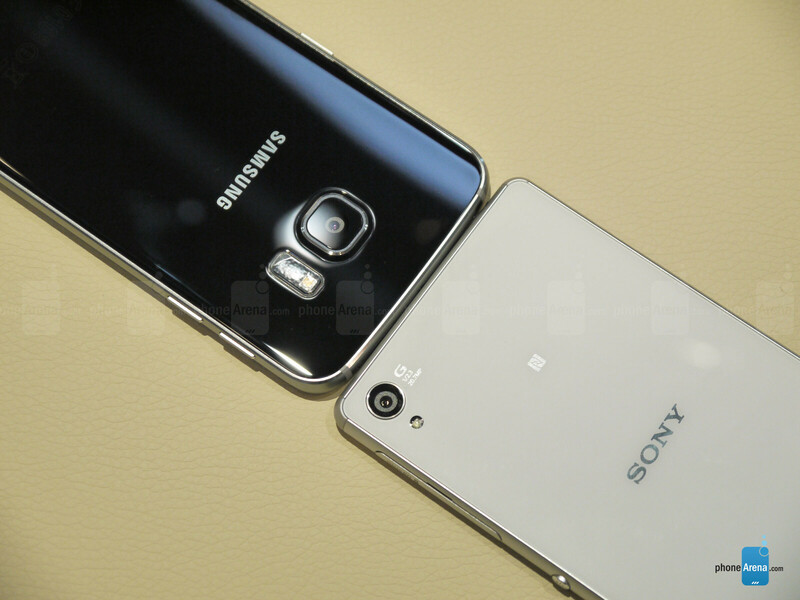 The Samsung Galaxy S6 edge sports a 16-megapixel main camera, while the Xperia Z3 has gotten a 20-megapixel main shooter. The Galaxy S6 edge sports optical image stabilization (OIS), while the Xperia Z3 has (a very good) software stabilization. Technically, the S6 edge has got a fast, f/1.9 aperture lens (on both the front and rear cam), while the Z3 features a slightly slower, f/2.0 lens for its main, rear camera. Samsung brings welcome improvements to the Galaxy S6 battery life and charging speed. Spec peepers will be quick to notice that the actual battery capacity has gone down from 2,800mAh on the S5 to 2,600mAh on the S6 edge, but with a more energy-efficient system chip, its most efficient display, and all of Android Lollipop’s improvements Samsung is able to achieve results in the vicinity of 12h of Wi-Fi browsing, 11h of LTE browsing, 13h of video playback and 49h of music playback, which is a good result. Turning to the Xperia Z3, it features a 3,100mAh battery that scores among the very best in our battery rankings, and could even outlast that of the S6 edge. Samsung also introduces fast charging capabilities to its Galaxy S6 edge, a feature that the Z3 lacks. The S6 can get recharged to an additional 4 hours of use with just a 10-minute trip to the charger. The Galaxy S6 edge also comes with wireless charging without the need for an additional cover which is great (it’s also another feature the Z3 lacks). Finally, the Galaxy S6 edge is about subtle yet futuristic improvements like the dual edge design. It’s not in your face (it feels a bit subtler than on the Note Edge, for instance), yet it does deliver some nice added value. 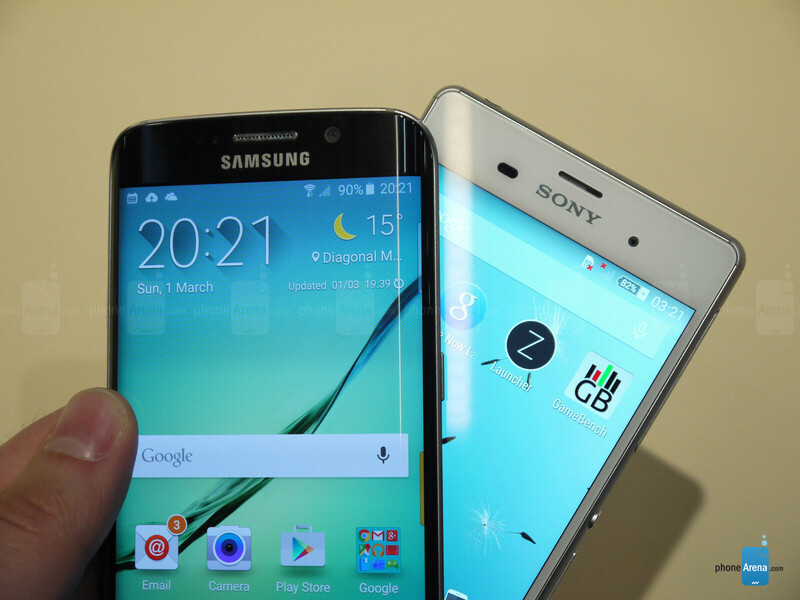 For all else, the Galaxy S6 edge and Sony Xperia Z3 are two good-looking flagship phones. Time has taken its toll and thte Galaxy S6 is the one with the much more powerful specs: a faster system chip, an improved camera and double the internal storage. The added benefit of fast charging is also neat, and all of these factors contribute to a feeling that the S6 edge is the better phone to get at the moment. If you don’t care about price, though - the Xperia Z3 is still a nice gadget for those who don’t want their spending on a phone to break the piggy bank. true they need something new to save them. and i meant to say isn't out done, my bad typo. My Z3 still looks better, has the ability to expand storage, and I can still pair my PS3 controller to play games. Not to mention the front speakers sound really good and all the waterproof, dustproof certifications. I would give the camera edge to Samsung at least until Sony releases the update with the new camera APIs and we can shoot in RAW. The S6 Edge is still a classy looking beast though. I Love Both , Specially their designs , of course galaxy s6 and s6 edge sound better , but Xperia Z3 still is a great phone and I think it would have a better price than the S6 , and a better Battery ! Umm Z3 does support fast charging via Qualcomms Quick Charge 2.0....... How did you get that wrong? Seriously. 1TopSpy is easy and convenient to set up for mobile phone spying and tracking. An account is registered online and the software is installed to the user phone through the web browser. Login is then made from the 1TopSpy platform, to which all monitoring information is directed. It is important to specify the internet connection for uploading data on the phone itself during set-up. Once set-up, all recorded data can be accessed from anywhere with an Internet browser. The design of the Samsung Galaxy S6 is nothing special. Sony has been using a metal frame with glass on both front and back for almost two years since the Sony Xperia Z1. As far as the display is concerned, the Samsung Galaxy S6 might have a Quad HD display with 1440 x 2560-pixel resolution but it is a PenTile display at the subpixel level, meaning that its real resolution is reduced by approximately 30-50% in comparison to an equivalent resolution RGB matrix display. Thus while the Sony Xperia Z3 has a Full HD display of 1080 x 1920 pixels resolution, it is an RGB at the subpixel level. In addition, the 424 ppi pixel density of the Sony Xperia Z3 is well above the 300 ppi pixel density which sets the limit for a retina display, while at the same time allows for longer battery life, since fewer pixels on screen means a less powerful GPU is needed in order to move them around. In addition, the Sony Xperia Z3 uses the Qualcomm MSM8974AC Snapdragon 801 Quad-core 2.5 GHz Krait 400 CPU which with its custom optimized core offers the best compromise between performance and efficiency. The octa-core system chip with the big.LITTLE configuration in the Samsung Galaxy S6 is a much inferior solution technically, since it can only adjust all four of its more powerful or its less powerful cores according to the energy demands of the task in use, while the Sony Xperia Z3 with its Qualcomm custom Krait core CPU can dynamically adjust clock speeds based on system needs. Furthermore, although Samsung claims that its Exynos 7420 CPU is built using 14nm technology, the truth is that Samsung's Front End of Line (FEOL) is 14nm, while their Back End of Line (BEOL) is still 20nm. Basically their 14nm process will have the 14nm speed improvements, but not the 14nm density improvements. Only Intel has full 14nm. As far as the benchmark comparisons are concerned, it is known that most manufacturers, including Samsung, they tweak their CPUs & GPUs so that when they detect that they are being benchmarked to operate at a higher frequency than usual since they will have to operate in these speeds for a short while without getting the devices hot or compromising the battery. 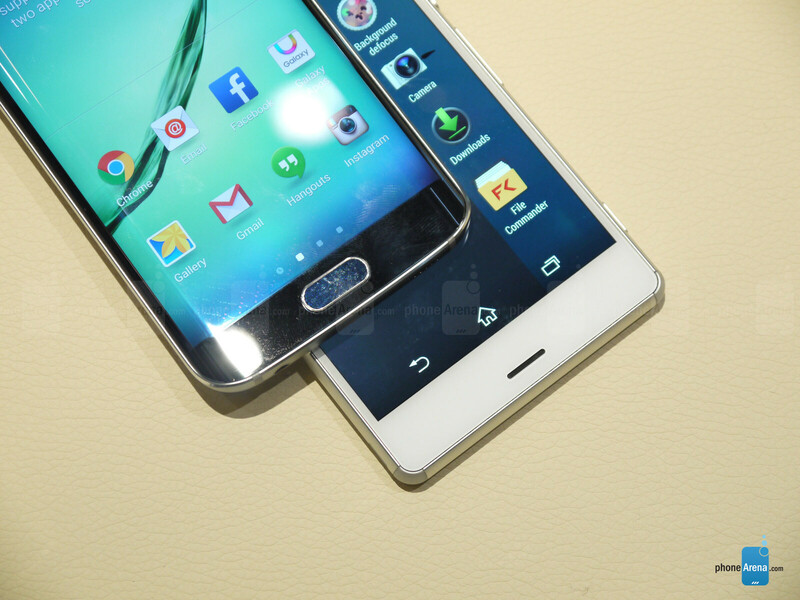 Both the Samsung Galaxy S6 and the Sony Xperia Z3 offer fast charging capabilities. Finally, the Sony Xperia Z3 offers an expandable microSD card slot and protection against dust & water (IP68), things that the Samsung Galaxy S6 doesn’t offer. Also, the proper Sony flagship Android smartphone to compare with the Samsung Galaxy S6, is the Xperia Z4 which will be announced in a couple of months, since this is the model which will have a similar product life cycle with the S6 from Samsung, The comparison above is unfair for the Sony, since the Xperia Z3 is at the end of its product life cycle while the Samsung Galaxy S6 has just been announced and it won't be available for another month at least. Both are equally good for me.